Salish for "place where people live"
The Nehalem River is a river on the Pacific coast of northwest Oregon in the United States, approximately 119 miles (192 km) long. It drains part of the Northern Oregon Coast Range northwest of Portland, originating on the east side of the mountains and flowing in a loop around the north end of the range near the mouth of the Columbia River. 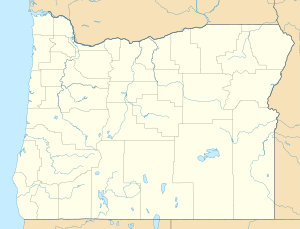 Its watershed of 855 square miles (2,210 km2) includes an important timber-producing region of Oregon that was the site of the Tillamook Burn. In its upper reaches it flows through a long narrow valley of small mountain communities but is unpopulated along most of its lower reaches inland from the coast. The city where the river flows into the Pacific is also used as the name for CPU manufacturing titan Intel's first-generation line of Core processors. It rises in the northeast corner of Tillamook County, in the Tillamook State Forest. It initially flows northeast, across the northwest corner of Washington County and into western Columbia County, past Vernonia where it receives Rock Creek, it hooks to the northwest and west into Clatsop County, then flows southwest back into northern Tillamook County. It enters Nehalem Bay on the Pacific in an estuary at Nehalem, about 70 miles (110 km) west-northwest of Portland. Near its mouth on the Pacific, the river passes under U.S. Route 101. It receives the Salmonberry River from the east in northern Tillamook County. It also receives the North Fork Nehalem River 25 miles (40 km) from the north about 2 miles (3.2 km) northwest of Nehalem, just before entering Nehalem Bay. In 2007, a major storm caused the Salmonberry Bridge (located at 45°45′00″N 123°39′10″W﻿ / ﻿45.7499°N 123.6528°W﻿ / 45.7499; -123.6528﻿ (Salmonberry Bridge)) to collapse. The bridge was rebuilt and opened to traffic on May 14, 2012. ^ a b c "Nehalem River". Geographic Names Information System. United States Geological Survey. November 28, 1980. Retrieved January 9, 2009. ^ a b Johnson, Jill. Maser, Joseph, ed. "Nehalem River Watershed Assessment 1.0 Introduction". Environmental Sciences and Resources Department, Portland State University. Retrieved January 17, 2009. ^ a b "Water-data report 2007: 14301000 Nehalem River near Foss, OR" (pdf). United States Geological Survey. Retrieved January 17, 2009. ^ "The Salmonberry Bridge Reopens". Tillamook Headlight-Herald. 15 May 2012. Retrieved 27 January 2014. At long last The Salmonberry Bridge on Foss Road at m.p. 13 has been rebuilt and opened to traffic May 14. The bridge washed out in the 2007 storm. Wikimedia Commons has media related to Nehalem River.